The general idea is to assign one scale to certain strings of the guitar and some other scale to the others. 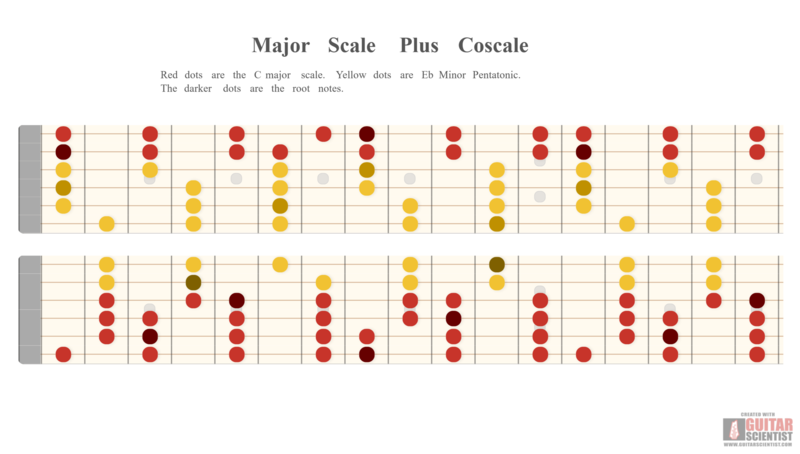 There are lots of ways to do this but a simple and musically useful one is this: give a scale to the high strings and its coscale to the lower ones. And the most basic one we can do is the major scale and its coscale, the minor pentatonic built a minor third above it. To get started with the patterns above, try playing a melody on the high strings accompanied by chords on the lower ones, or vice versa. Or try building chords on a string-set that mixes both scales. You can switch freely between the two setups (major on top, pentatonic below or vice versa) and let each scale wander into strings it isn't supposed to occupy once you've got used to the basic setup. Of course you can just let one scale or the other take over completely for a while, and you can modulate to a different key and use the same idea, and you can use the patterns above to play any mode of the major scale. So these patterns are much more flexible and interesting than they deserve to be, given that they're made from the plainest possible ingredients so you almost know them already. Of course this idea can be applied in all kinds of different ways, but it feels a bit shallow to be something I want to put a lot of time into. It's determined by the geometry of the guitar rather than musical concerns, so I'm leery of it. But it's easy, and sometimes easy is nice. Things don't always have to be challenging: it's OK if sometimes all you do in the woodshed is sing.